Whether you prefer to have your firearms stored safely away in a closet or displayed proudly in your home, storage and safety are critical components of being a responsible gun owner. 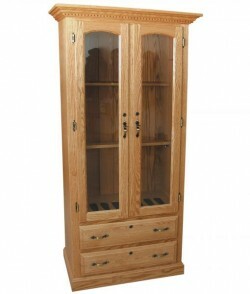 To help meet these needs, Amish Originals offers a variety of gun cabinets for your home or office. Like all of our other furniture, each gun cabinet is made-to-order and is available in both corner and flat wall styles—both options may be customized to accommodate a particular number of firearms. 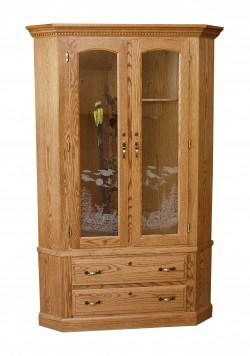 Built with your choice of Red Oak, Maple, Cherry or Quarter Sawn White Oak, gun cabinets also include drawers that hold ammunition and other supplies. Both open (glass front) and closed (solid wood) doors are available. Door and drawer locks are standard on all models. Locally owned and operated since 1992, Amish Originals has built relationships with more than 70 families in Ohio’s Amish Country who provide beautiful and durable furniture for every room in the home. 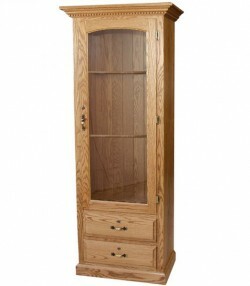 Our gun cabinets are made from responsibly harvested, kiln-dried, solid American hardwood. These quality materials are matched with outstanding craftsmanship—fine, classic detailing that results in heirloom-quality furniture. To learn more, stop by our showroom in Uptown Westerville to select a gun cabinet that will beautifully complement your décor.